This Wrasse also known as the bird wrasse is a very attractive fish with its dark blue/green colouration and its unusual elongated snout which it uses to great effect for catching prey in amongst rockwork. 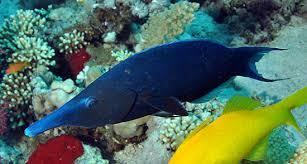 As it matures this fish changed from brown to green to blue. This fish is reef safe but should not be kept with ornamental shrimp , it will eat all foods and is a very greedy feeder.